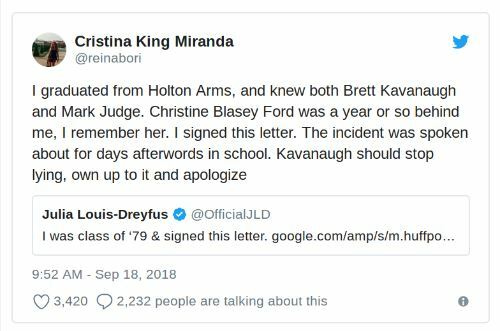 A woman named Cristina King Miranda said she went to the same school as Brett Kavanaugh and Christine Blasey Ford. Miranda also claims she knew of the alleged sexual assault incident. Well, now she’s not so sure anymore. In other words, Miranda is backtracking HARD. What you did did not help her. There. You got your 15 minutes of fame… Congratulations! You posted complete hearsay & you’ve actually hurt Dr Fords case not helped. Your bias & prejudice displayed in your post was stunning to read. Bitter much? So you offer nothing. Congrats. NBC News actually ran with Miranda’s story – even after she backtracked. Blasey Ford has another wild excuse as to why she can’t testify on Monday – the day Senate Judiciary chair Chuck Grassley has made clear will be the day Senators vote to confirm Kavanaugh. Next she'll claim she can't testify because she's washing her hair that day. Grassley offered to come to her. After holding a conference call on Friday morning, the committee’s Republicans accepted some of Ford’s requests, such as allowing one camera in the room, making sure Kavanaugh and Ford aren’t in the same hearing room at the same time and giving Ford breaks during testimony as well as security from the U.S. Capitol Police. The GOP, however, rejected requests to limit questions to senators only, make Kavanaugh testify first and to subpoena Mark Judge, who Ford claims was in the same room with her and Kavanaugh during the alleged incident in high school.